The kill your self bridge is located in old bridge new jersey, which is a town over from mine. I have never been there, but eventually would like to take an adventure there to see what its really about. The legend says that a long time ago a boy fell into the river by the bridge and if you throw a coin into the river you will see a reflection of the boy and it looks like he is trying to push you into the river. Other people have said that it is on top of an Indian burial ground and also a meeting place for the KKK. Another claim is that there is a homeless man that lives under the bridge and if you go near it he will come out with a knife and chase you. Some of my friends have been there, but all they said was that it was creepy and there was a lot of graffiti every where saying kill your self bridge. Clinton road is part of weird new jersey. Many people have claimed to see paranormal sightings there. I personally have never been but definitively want to go to see what its all about. The road and the land around it have gained notoriety over the years as an area rife with many legends of paranormal occurrences such as sightings of ghosts, strange creatures and gatherings of witches, Satanists and the Ku Klux Klan. It is also rumored that professional killers dispose of bodies in the surrounding woods—with one recorded case of this occurring. It has been a regular subject of discussion in Weird NJ magazine, which once devoted an entire issue to it. In the words of a local police chief, "It's a long, desolate stretch and makes the imagination go nuts." There are few houses along this road, its mostly made up of trees. In 1905, a man named Richard Cross built a castle on high land near the reservoir for his wife and three children. Later in the 20th century, it fell into ruin after a fire had destroyed part of it and thus became a popular destination for hikers and local teenagers looking for secluded locations to camp out and have parties. According to Weird NJ, "visitors have written telling of strange occurrences in or near the castle site, such as people going into seizures and having bruises appearing on their bodies afterwards, or having strange, disturbing visions. Writings that suggest Satanic symbols have been reported as appearing on the castle's interior walls, particularly in areas that were supposedly inaccessible." Newark's water department razed the castle as an attractive nuisance in 1988, but the foundations remain and several hiking trails still lead to the site. Alternative medicine involves anything that is believed to have the healing effects of medicine, but has not been linked to enough scientific evidence to prove it truly works. Alternative medicines have been around for thousands of years and exist in many different forms. Some new and traditional "medicines" include homeopathy, chiropractors, energy giving medicine, forms of acupuncture, "ancient chinese medicine", and most popular, Christian faith to pray and get healed. Alternative medicines are not recognized nor practiced by most medical schools. Most alternative medicine is based on religion, tradition, and the belief in superstition and therefore is typically found to be froud. For example, . One of the most common viruses that we have to worry about every year is the flu. When a person gets sick, they go and get treatment for their ailment. One medication in particular that Park looks at is called oscillococcinum. This homeopathic medication sits on the shelf at pharmacies along with other over-the-counter flu medications. The other medications do not say that they are able to cure the flu or stop a person from getting it. Instead, these medications are there to ease the symptoms that a person would suffer from such as muscle pain, nasal congestion, and other symptoms. Likewise, these medications also list the side effects they have. The unique thing about oscillococcinum is that it has no side effects according to Park. The concentration of this magical medication is at 200CK HPUS. The "C" means the initial dilution is one-hundredth dilated and the 200 means that the process was repeated for a total of 200 times. If ever interested, one of the best sites to check out for alternative medicine is http://www.miraclealternatives.com/ . What Day of the Week were you born? What does it mean? There is a belief among spirit people that believe that the day of the week the child is born effects what traits they will grow up with.This belief come from "ancients" that named the seven days of the week after the seven visible spheres, the planets in the solar system. The Sun, Moon, Mercury, Venus, Mars, Jupiter, and Saturn referring to the English, Roman, Norse and French languages, it is very easy to see the connection between these spheres and our and our days of the week. This can be seen as a form of astrology and there is actually a poem that states some of the characteristics. So given that poem I was born an a Tuesday and am full of grace. I don't think is true but it is a belief that might give some parents comfort. I have also notice there are not really any bad characteristics on this list except for Wednesday and Thursday , what does far to go mean? Does that mean that child will struggle their whole life or will go far in life? And a worrying child is a Wednesday baby? On December 26, 2004, an underwater earthquake created a tsunami by the coast of Banda Aceh. Many communities were affected by this event. The people of Aceh are a very religious Islamic society, these people tried to figure out the cause of this disaster, they could either rule it out as American terrorism, they thought that the American Army was testing a new weapon against them. They also thought that this was an act of their god punishing them for their sinful acts. In these types of religious societies, everything seems to revolve around religion and their relationship to their god. It seems rational to think that this was an act of God punishing people for their sins because the Bible itself talks about a major event that was very similar called The Great Flood, but that’s if you believe in the Bible. There were about 300,000 people killed by this tsunami, did all these lives needed to be taken? Was this punishment necessary? People who believe in religion and who see these natural disasters as acts of God will believe it because they choose to, in a way, it gives them a feeling of comfort. Being able to blame such tragic events on someone or something gives them control over how people think and even how they behave about it. In the modern world, we are able to determine exactly why these sort of natural disasters happen; there is a scientific explanation behind them. Religious people will still say that God has a part in everything, and that all comes back to the element of thought: point of view. We all choose to explain things how ever we wish to. There are people who believe that God controls everything that happens, there are others who don’t, as I said we all have different points of view. Some people argue that the Mexican culture was built around superstitions. One of the superstitions that I can relate to very personally is that Mexican people believe that pregnant women should not look at an eclipse. If a pregnant woman looks at an eclipse her child will most likely be born with a cleft palate. When an eclipse occurs, pregnant women are supposed to wear red clothing and carry around with them a metal object such as scissors. I was born with a cleft palate, my mother had never heard of this superstition before until she met other people who had the same birth defect or children’s mothers at hospitals. My parents are very religious and very superstitious as well so they used this superstition as an answer to why I was born this way. My mother could not remember if she saw an eclipse or not while she was pregnant but she decided to think of my defect as God’s will and that she should not question it. A father took a picture of his daughter on the beach of Zushi, Japan and when he went to look at the photo a little later he noticed that it looked like someone was standing behind his daughter. The man insisted that he did not mess with the photo in any way. He said that he took a few pictures and when he went to look through them later he noticed that there were a pair of boots behind his daughter in the photo. After he saw the photo he put it up on a ghost section of Reddit and many people said that it was Samurai footwear that belonged to a ghost warrior who "must have wondered over from a nearby graveyard." Someone else said it might be an old US Navy uniform from the WWII era. There have been other kinds of photos similar to this one, where weird things have been standing behind a person who were thought to not be there. There could be an easy explanation to this and say that the dad just didn't notice that there was someone behind his daughter on the beach when he was taking the picture, however he said that his daughter is shy and she would have noticed someone behind her and in all the other pictures he took there was not anyone on the beach behind her. Definitely something weird, but it is entirely possible that he did not notice someone or that he doctored the photo. The Flying Spaghetti Monster (FSM) was created to be a god of the Church of The Flying Spaghetti Monster; and his disciples are called “Pastafarians”. In 2005, a Kansas School Board tried to change teaching curriculum and decided to teach ‘Intelligent Design’ in conjunction to evolution in science classes. Intelligent Design is defined, "certain features of the universe and of living things are best explained by an intelligent cause” In response, a student (Bobby Henderson, a 24 year old Oregon State University Physics major) wrote an open letter to the school board about the Flying Spaghetti Monster, and requested that it’s “Noodly Appendages” be taught alongside evolution and intelligent design. It has been said that the Flying Spaghetti Monster created the universe after drinking heavily. In result, his intoxication is the reason why the earth is so flawed. Pastafarian beliefs suggest the FSM’s first disciples were pirates, peace loving explorers, spreading their good will. Their theories have caused them to believe that as the number of pirates decreased, the global temperature increased, causing global warming and natural disasters such as earthquakes, and hurricanes. Pastafarians celebrate on Fridays, which is their Holidays (Holy-days). Prayers end with “Ramen” (in contrast to “Amen”) and their heaven (The Great Pasta Bowl) consists of a stripper factory and a beer volcano. Their hell (The Freezer of Doom), is the same as heaven but the beer is stale and the strippers have STD’s. Before researching this pseudoscience theory, I thought it was the most ridiculous thing I had ever heard. After reading this pseudoscience, I was right, it was the most ridiculous thing I had ever heard. Some of its beliefs seem rather dark, which may cause it to be offensive to some people, but I am able to find some humor in it. Don't sit too close to the TV or you'll lose your eyesight! When playing my Super Nintendo and Playstation as a child one thing was for certain, I was on the floor a few feet from the bright TV screen. Even today if I am taking a game seriously that's the position I have to be in. The only thing that has changed over the years is my eyesight. I can hear the echo of my mom now, "If you sit too close to the TV you'll hurt your eyes!" Just as her mom told her. If you do feel yourself straining your eyes to watch or read you may get a headache but thats it. The straining will not cause your eyes to become weaker. So you can sit in front of the TV to your hearts content (or how long you can withstand the inevitable headache) In many cases believing in the myth isn't too bad as it can prevent unnecessary eye straining, head aches, and a way for parents to get their kids away from the television and outside. I'm sure we've all once heard going bald can be a result from wearing a hat. In most cases when your told this you quickly take your hat off. But how does one go bald? Balding can be the result from genetics, stress levels, diseases, medical treatments, and poor life choices like smoking. Probably the most popular is male/female pattern baldness (androgenic alopecia) has DHT (dihydrotestosterone) to blame. DHT absorbs nutritionist hair follicles should be getting which causes miniaturization. Miniaturization in return makes the hair you once had into barely noticeable peach fuzz. It's all hormonal. So if you've had a hat you've been wanting to wear go out and wear it! There's no one to blame but yourself, genetics and stress which produce the DHT. The correlation between going bald and wearing hats is really just that. Balding was probably in the works and the hat is taking the blame. If you are already thinning and wear a hat to cover it up, you may just be furthering your baldness by stressing about it. The hat is just the innocent bystander. As we've talked about many times, superstitions often arise out of the fear of uncertainty or the fear of failure. It would only make sense that musicians would have superstition regarding their live performances. On the website Independent Music Promotions, they explored some superstitions specific to some well known artists. Some of these are confirmed while others are mainly just rumored. One Direction is said to share a bath together before a performance. Personally, this seems a little far fetched and was probably concocted from the mind of one of their more… let's say enthusiastic fans. Keith Richards of The Rolling Stones has to eat a Shepard's Pie before a gig. Adele apparently suffers from stage fright and has created an alter ego for herself when she performs, who she calls Sasha Carter. This actually doesn't seem all that unusual to me given that we have David Bowie and Marilyn Manson. It's said that Ke$ha has her crew strip down and roll around in oil and glitter before shows. Not entirely sure whether I should believe this one or not… And then we have Led Zepplin. Robert Plant apparently needed a space in which he could iron his shirts before shows. Teen.com also did an article exploring different artists' pre-show rituals. Lorde apparently has a lucky blanket that she naps with before shows. Beyonce is known to sit in a massage chair while her hair and makeup is done (which seems more like a comfort thing than a superstitious thing) and she sometimes prays before she performs. Paramore is also a fan of prayer before shows. To me it makes a lot of sense that musicians, or really any performers, would be superstitious. It's a high stress situation and they have a lot of pressure to perform well. While many of these little rituals realistically have very little impact on their performance, if it eases their minds before a show I don't see the harm. It's very much a placebo effect. Performing their rituals makes them feel more confident, and then, in turn, they are able to put on a better show because of it. Astral Projection is something I heard of years ago and never really put too much thought into it. Astral projection is "an interpretation of an out-of-body experience (OBE) that assumes the existence of an "astral body" separate from the physical body and capable of travelling outside it. "(see Webster's New Millennium Dictionary of English) I watched the movie Insidious and that turned out to be what the movie was about. It made me think about it quite a lot. It is an interesting idea, when you go to sleep you dream and or have an out of body experience or both, and it feels as though you are actually travelling to a different place, almost in a different dimension as a spirit. In the movie it is just that that gets a young boy into trouble. After having inherited his astral projection or "travelling" skill from his father, he journeys too far into what is described as "the Further". In this astral plane there are bad spirits that wish to now inhabit the boys sleeping body (i.e. the empty vessel). I have always been a sleep walker and always have elaborate long dreams of which I can remember great detail. Sometimes I will spend what is days or a week in a dream. I've always seen it as a blessing and a curse. I have never experienced an out of body experience but have met others who have. Just recently I spoke with someone who said they had a few when they were in their twenties, which they attributed to religion and a soul. They actually felt that their soul had temporarily left their body. I asked about astral projection and explained what it was. They seemed to agree with the idea. I went on to elaborate on pseudoscience and we had a decent intellectual conversation over the matter. I don't necessarily believe in astral projection or the like but it is a nice explanation to something that is mysterious. Also it adds to humans almost a supernatural element (i.e. our ability to be dualistic and separate our soul from our body.) This may be why it is such a popular belief, because it makes humans sound capable of more than we are, naturally. Acupuncture is the stimulation of specific acupuncture points along the skin of the body using thin needles. Acupuncture is a form of alternative medicine that is wildly popular in traditional Chinese medicine. Since acupuncture does not follow the scientific method it is considered a type of pseudoscience, it is considered ‘borderlands’ science because it is in between normal and pseudoscience. Supposedly, acupuncture is said to correct the imbalance in the flow of Chi. However, there has never been any evidence to support the claims of acupuncture along with the Chinese concept of Chi and acupuncture points. To many Chi differentiates a corpse from a live human being and in order to be in good health and be pain free, Chi needs to circulate throughout the whole body. Many acupuncture patients partake in hope to relive pain like chronic back pain or muscles spasms. Some research has shown acupuncture can reduce pain while others say it is simply by chance and only effective do to a placebo effect. After having an acupuncture procedure that usually consists of five to twenty needles. The needles are left in place for about twenty minutes. Then patients go through a consultation that can last up to an hour. In the evaluation patients have there pulse checked on both arms and their tongues are inspected. Preformed properly by a professional there are no serious risks however, one should be cautions. People need to be aware of scams and acupuncture can fall into that category. There are serious implications that can come from something like this. People think they are being helped and cured when in reality no scientific evidence supports the claims that your Chi magically becomes balanced and pain is eliminated. Not to mention people spend a fortune on such procedures. An average acupuncture session can cost any where from sixty to a hundred and twenty dollars that may not seem like a lot but many acupuncturists recommend their patients to have fifteen to twenty sessions. Since people believe they are being helped they will spend the money without researching or asking to many questions. Before you consider such method one should know the risks, if the acupuncturist as the right credentials, and if it is a worthwhile investment. From the time we are children, we are intrigued by mythical creatures and folk legends. When we are children, these folk legends grab our attention and makes our imaginations run wild. The possibility of these creatures being real excites us. However, as we grow older and wiser, we tend to label the legends as fallacies. There are some individuals whose belief grows stronger and may trun into an obsession. Throughout the world, there are many people out there who devote their lives to hunting down various urban legends. Some of the most popular mythical creatures include Bigfoot, El Chupacabra, and the Jersey Devil. One of the most popular and most recognizable urban legends throughout the world is the Loch Ness Monster or Nessie, for short. Nessie is thought to be a lake monster that lives in Scotland's Loch Ness. The Loch Ness Monster soared in popularity and exposure in 1933. Various people around the area in 1933 began to descibe witnessing a large creature in 1933. There has been numerous pictures that have surfaced of Nessie. However, most of the pictures are of poor quality. 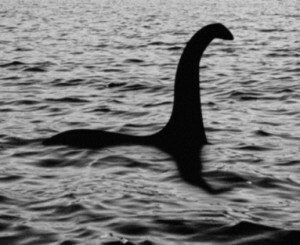 As of now, there is no conclusive evidence that Nessie exists. However, that does not mean that the hype has died down over the years. In fact, http://www.nessie.co.uk/, is a website entirely devoted to Nessie. The website actually has a live webcam of Loch Ness. There are numerous Elements of Thought at play when it comes to the Loch Ness Monster. The first one being Concepts. Within concepts, you will find theories. When it comes the mystique surrounding Loch Ness, many theorize that there is a sea monster hiding in the depths of the water. The next Element of Thought is Interpretation and Inference. People look at old photographs of the supposed "Nessie" and infer that it is in fact, a sea monster. The last Element of Thought is Point of View. Everyone has their own belief. However, there are some people who have share the same point of view. They believe that Nessie exists. As for me, I would like to believe that a sea monster exists. However, it would be illogical to fully believe that. A popular belief held throughout history is that if you disturb a mummy’s final resting place, you will be cursed to die. Many thought that this may be a ploy by the Egyptian government to stop grave robberies. It was really just created to preserve the Valley of the Kings. 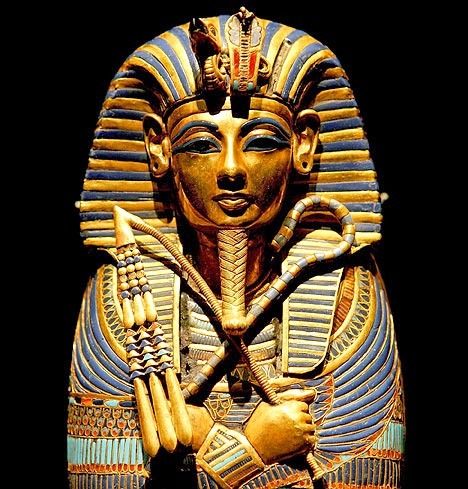 However, in 1923 some strange things started happening after the monumental discovery of King Tut’s tomb. First, Howard Carter’s (the archaeologist who discovered the tomb) beloved pet canary died by a cobra bite. Many people felt that the cobra was personally sent by King Tut because they were often symbolic of the power of Egyptian rulers. It was predicted that this would be the first of many deaths and indeed, this was the case. Next to die was Lord Carnarvon. He was the current Earl of Highclere Castle (fictionally known as Downton Abbey) and fully funded Howard Carter’s expedition. Lord Carnarvon was bitten by a mosquito, and then he nipped his neck while shaving. He then tragically died of blood poisoning. One of Howard Carter’s best friends, Sir Bruce Ingham had his house burn down twice. It was said that he received the gift of a mummy’s hand that had a bracelet which contained a warning that anyone who possessed it would be doomed. In the years following the opening of the tomb, nine more individuals who were closely associated with the tomb died horrible deaths. Even though it may seem logical for some people to point toward the curse as an explanation to the mysterious deaths, they should not. According to The Elements of Thought, these individuals have assumed that the deaths were solely caused by the curse. However, scientists have proved otherwise. It has recently been discovered that the tomb contained a deadly bacteria. They feel that this could account for many of the untimely deaths that followed in the wake of one of the greatest archaeological finds in human history. 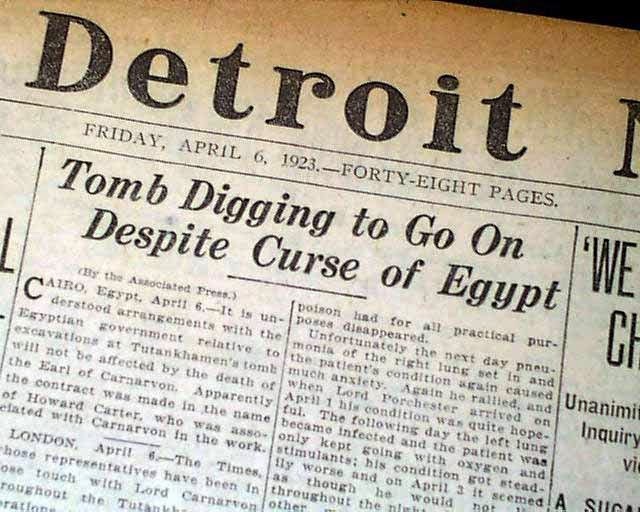 It was also said that the newspapers of the time were to blame for the rise of the curse because as soon as the tomb was opened, they wanted the opportunity to make as much money off of the discovery and the supposed curse that went along with it. There is a magical board that his the capability to speak to the dead and answer any question you ask it, this board is known as the Ouija Board. The board is commonly sold in almost any toy store and has been the midnight entertainment on spooky nights for thousands of children, but is this board really a toy? The Ouija Board's origin dates back to 1886 when a news paper called the New York Daily Tribune wrote about a strange board with letters used in Ohio. The paper stated that the board was used so that spirits could communicate with the living. The popularity that game this board led three men in 1890 to make things board even bigger. Elijah Bond, Charles Kennard, and William H.A. Maupin decided to make this board into a toy for everyone to use. They purchased a patent on this Ouija Board meaning "yes" and sold it for $1.50. From there the board modernize and turned into the many games and even movies we have about the board today. Many people doubt the validity of the boards power to speak with the spirits, but there are some believers as well. Most people say that one of the people playing with them is making it move, or some other reason. I actually have had my own experience with the board which made me somewhat a believer. I was playing with 4 of my friends in a dark room and night with the candles on to "welcome" the spirits. We all put our fingers on it and nothing happened for 5 minutes, but then finally the board started to move. I swore that it was not me moving it and it did not look like my other friends were moving it either. The board moved around to different letters spelling a story about a man named Tom who lived down the street who died in a car crash. Tom told us he was just looking for his wife the whole time and could not "pass on" until he did. Tom answered yes or no questions for us multiple times and it seemed pretty believable. I can't say that I believe in ghosts, but unless my friends were lying to me, I can't explain how that happened. Its not just myself who have had these similar experiences, there are thousands of people who post experiences like mine on the internet everyday. There is not much proof to their stories, but having an experience like I did I can relate to these people's posts. When thinking about the elements of thoughts with the Ouija Board there isn't much to think about, it is fairly cut and dry. There is no proof or facts supporting it, its not backed by science. It is mainly just assumptions and believing what you see, Ouija Boards fake or not don't have any negative notions or implications either. There is a dietary supplement that has been trending in recent time. The supplement is a plant called Garcina Cambogia that is also referred to as Garcinia gummi-gutta a pumpkin shape colored green. It is native to Asian culture and is used in many asian Dishes for flavors. The extract from the plant Hydroxicitric Acid is the active ingredient and what causes the weight loss in subjects. This is Related to Pusedoscience because there is a lot of hype though social media, radio commercials, and TV ads. It gets consumers eager to buy and try it because they associate it with a magic pill, and will no longer have the need to exercise or watch what they eat. They think purchasing this product will solve all their problems. When in reality this is not the case, in fact in the article there were multiple tests done on lab rats and on human subjects as well. While the chemical worked on the rats fairly well, this was not the same for humans. Of all the various tests that were done the results were all very inconsistent, and in some cases the placebo group lost more weight then the test group. This chemical making its way in the media to me is bad, because even with evidence, its surfaced to be a quick fix magic pill, and people who are health concise may see this supplement on the shelfs and quit their healthy lifestyles for a magic pill. Because I work at Six flags and have an interest in the paranormal, I did my research about a certain event that happened in the park. On May 11, 1984, eight teenage visitors were trapped and killed in the Haunted castle attraction that was burned to the ground. Six Flags as a company was investigated and found not guilty. There was also another story about an employee dying from Rolling Thunder back in 1981. A guest and her boyfriend were sitting down where they felt another presence sitting down next to them, wearing 80's style clothing. As an employee, I do feel a little creeped out when I walk out at night, as I walk by where the Haunted Castle was located prior to the fire. I have also heard many noises walking at night, but those could always be animals. All of the people I work with feel just as creeped out as me when they walk by the same area. Get rid of all the bad toxins in your body with this one easy product, the Detox foot-bath! Detox foot baths are a commonly used practice in detox and rehab clinics around the world and they literally do nothing. People spend tons of money on these ‘magical’ foot baths that have no scientific evidence or proof to them at all. Detox footbath is another topic brought up in a class I have had before and we have gone over before extensively. A Detox footbath is essentially a bath where an electrically current is passed in order to draw the “toxins” from your body. Your toxins will change the water color depending on how many toxins are taken out. Its actually just a simple science experiment that can be done, but still is used by many physicians and clinics. The main point of detox is to make the body’s pH more alkaline and separate the good and bad ions from your body through your feet. Apparently an alkaline body is crucial to a person’s health and not having one can cause more diseases to happen. What really happens when you put your feet into this electrical current though? The real chemical process that is happening when the color changes is from the electrolytic corrosion of the metal electrodes in the water. The water can contain some iron, nickel, and even copper, which would contribute to the color. The amount of salt and the pH of the water can greatly change the colors that would result as well. These colors are supposed to be the bad “toxins” leaving the body when its just a simple science experiment. The implications and complications that can come from something like this is what happens with all scam medical products, people will actually think they are being helped. Sick people will spend lots of money on these products to cleanse themselves when its really doing nothing and in turn making them worse.